The Experience Map, an essential deliverable! | Yu Centrik Inc. The Experience Map, an essential deliverable! In every User Researcher and UX Designer’s toolbox, is a deliverable that reaches everyone, is easy to interpret and able to convert the most recalcitrant: the customer experience map*! 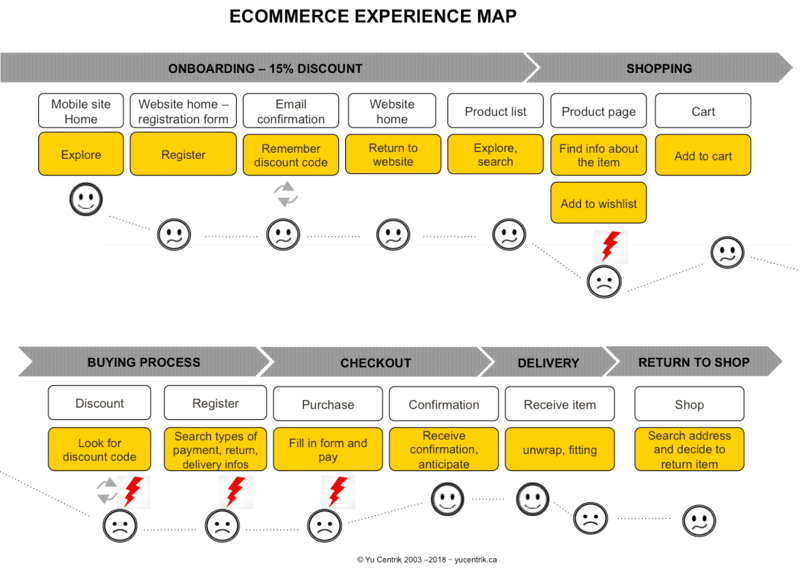 This map illustrates the customer or the user’s journey as it is really experienced. There are different ways to map these experiences, multiple examples are available on the Web, all forms are useful, from the simplest to the most sophisticated ones. The journey identifies and illustrates visually the multiple customer touchpoints, positive and negative experiences with the organization and the emotions generated. In a nutshell, it is a powerful tool to share the customer experience with all relevant team members (product, design, marketing, customer service, BI and IT and more). The simplicity of its visual representation is able to quickly convince key players of the importance of improving one or more elements of the customer service, and to identify any missed opportunities. The experience map represented here is a true omnichannel experience: An online purchase that starts on the mobile site, then on the web site of a well-known Canadian brand that sells its products online and in-store. The objective here is to demonstrate that the site presents opportunities for improvement that would significantly reduce the drop-offs and increase the conversion rate. 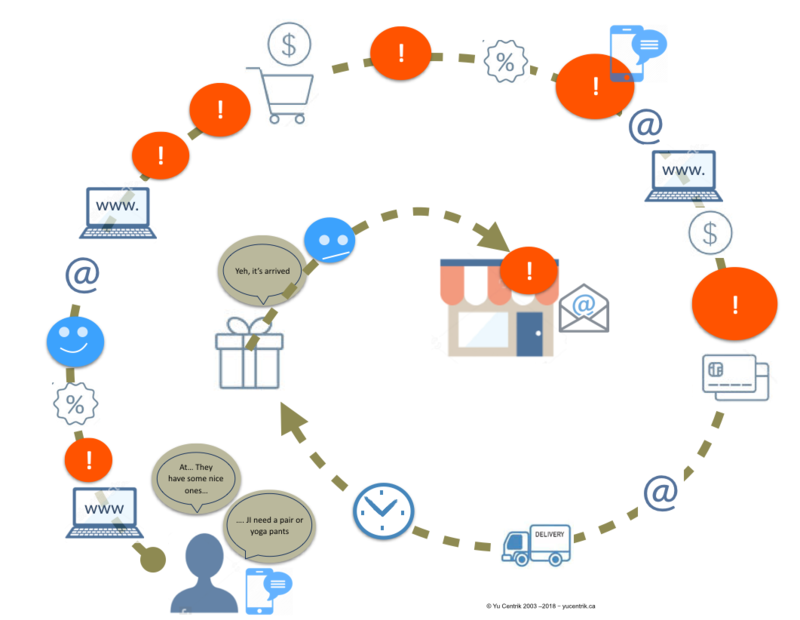 Two representations of an online purchase are shown here, one describing the tasks and the other visually expressing the pains and the gains. It starts with a need, a desire to buy some yoga pants. A quick glance at the mobile phone reveals that buying this type of product requires a slightly larger screen. Continuing on the website of the same company where a large pop-up invites the customer to get 15% off immediately upon registration. It’s enticing, why not! The registration is fast, 2-3 pieces of info, enter the email address and hop, here’s the discount, that’s the user’s anticipation. Not so easy, as described on the map, it is from this moment that things get complicated: a validation of the email address is necessary before you can use the discount. Obviously this causes an interruption in the shopping task that could prove fatal to the merchant: leave the website to read the mail entity and confirm the email address. And it gets worse if we do not take note nor remember the discount code sent by email, as you’ll need to come back again to mailbox, as is the case in this experience. The more we try to move forward searching, selecting and adding the product to the cart, and the more things get complicated. Information about the size, color, material, and product view are difficult. Information about the type of payment accepted and the conditions of returning the items are missing at the very moment when one should be reassuring the future customer and be pampering him or her. The purchase form does not allow you to see the selected item at any time and the steps are not predictable. This is an accordion principle where when you go to the next step, the previous step disappears which is not a best practice. Many would have abandoned the process, but our goal was to go to the end of the process, so we hung on until the confirmation of the purchase. Phew, the confirmation arrives quickly by email, as well as the expected time of delivery. The product arrives quickly, only three days later but unfortunately the size is too big. We decide to return it in store. The team on the floor does not seem aware of the procedures for returning purchases that have been bought on the Web. We are told however that this type of leggings should be purchased a smaller size, so why not mention it on the site from the start? Several phone calls later, we get a refund and leave a little disappointed the smaller size is not available in stores. We encountered multiple problems on this site. They are linked to a lack of respect for user interface standards, usability standards, lack of knowledge about trust and online security issues, and many disruptions in the omnichannel ecommerce cycle (people in stores should be aware of what is happening online). Consumers still face many barriers that prevent them from fully embracing a digital service channel. We are in the era of Service, and everything is Service. Consumers are becoming more demanding, their expectations are high and their loyalty is low. Even adopting a loyalty program will not prevent them from swapping brand, supplier or service. Companies must adapt quickly and take the means to engage and retain their customers! When organizations are asked how important user experience is for them, all of them say user experience or UX (User Experience) is their # 1 strategy. In reality, they are still far from having operationalized their desire to offer optimal experiences. It results in a shortfall and dissatisfied customers, consumers or users. The experience map activity builds internal knowledge, brings consensus within the organization, and helps create fluid and consistent customer experiences. The three levels of UX certifications we offer encompass all facets of what user experience really is and its true value. There is a range of activities and tools that can be integrated into the development cycle before design, during and after use, to ensure delivery of a product and service that is easy to use, that meet required needs and which engage customers. 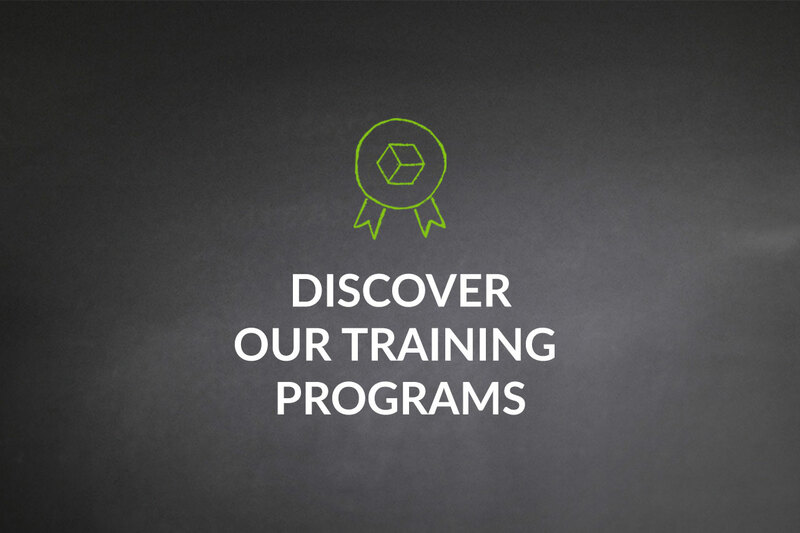 These courses are designed for IT and digital managers including product owners, account managers, product managers, project managers, marketing managers and more. It’s for those who want to better understand UX and/or how to integrate UX activities into their projects. No prerequisite is needed for UX-PM1 certification apart from a curiosity for the subject. See the dates of our next courses in French and English on Technologia website: Ottawa (English), UX-PM1 April 11-12, 2018, UX-PM2 May 10-11, UX-PM3 May 16-17, 2018. * Adapt this customer experience map to your context, you can be called user experience map, consumer experience map, patient journey map, etc.